Guignardia leaf blotch is a fungal disease that affects many Aesculus species. 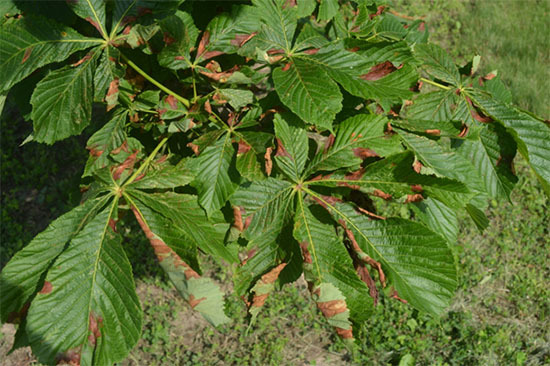 In Illinois, this disease is commonly seen on the common horsechestnut (Aesculus hippocastanum). Symptoms begin as rapidly enlarging, irregularly shaped, water-soaked areas. 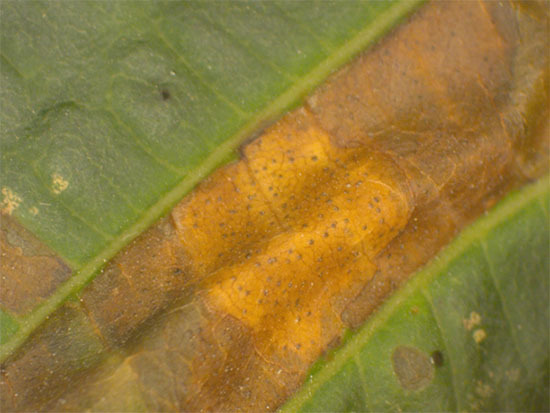 Affected areas eventually turn red-brown with a yellow halo that merges with the surrounding healthy green tissue. Small lesions will initially be limited by veins, but can enlarge, coalesce and lead to distortion and partial shriveling of leaflets. Tiny black fruiting bodies appear within lesions, which help to distinguish from environmental scorch. These black fruiting bodies produce spores which contribute to secondary infections. In more severe cases, premature defoliation can occur. Fortunately, severe symptoms do not develop until late in the season when annual growth has nearly finished, so tree health is not greatly impacted. Common horsechestnut (Aesculus hippocastanum) with symptoms of Guignardia leaf blotch (IL, June 2014). The tiny black fruiting bodies produced by the fungus are visible with the naked eye or with the use of a small hand lens. The fruiting bodies help to distinguish the fungal disease form environmental scorch. Guignardia leaf blotch pathogen overwinters as fruiting bodies in fallen leaves. In the springtime, fruiting structures will release spores into the air, some of which will land on developing Aesculus leaves. An extended period of leaf wetness following spore landing will initiate germination and infection. About 10-20 days after infection, infected leaves can produce new fruiting structures and initiate secondary infection cycles.